Happy Saturday! I'm off for a busy day today but I won't be leaving without sharing some of the "highlights of the week" in terms of Beauty. 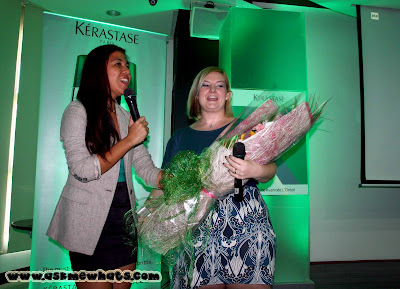 I was invited to the Launch of Kerastase Force Architecte and my schedule permitted me to attend and take along with me my "nosy personality" and the event did not fail as I learned a lot and will definitely share what I learned here! Green is the color of the range and to make it easier to understand, this range is used to renovate the fibre, strengthen hair from root to end. After our scrumptious meal, we were all led into a room where Maita Gaerlan, Junior Product Manager of Kerastase Philippines welcomed everyone and introduced us to Kerastase Media Advocate, Ms. Laura Charlton. 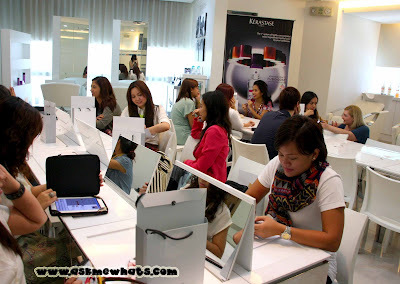 Ms. Laura Charlton, Daughter of David of David's Salon gamely talked to us (with a cute mix of Taglish which I find so cute) on how 1 in 4 women has weak hair and suffers from split ends. Here are the statistics that I took a shot of on how we manage to make our hair suffer on a daily, weekly, monthly and yearly basis! I've always wondered how the damage of hair can be measured and thankfully, it was well explained through the Hair Erosion Scale made by the Kerastase Institute. Level 3 and 4 - From chemical treatments like hair coloring, perming, re-bonding etc.. 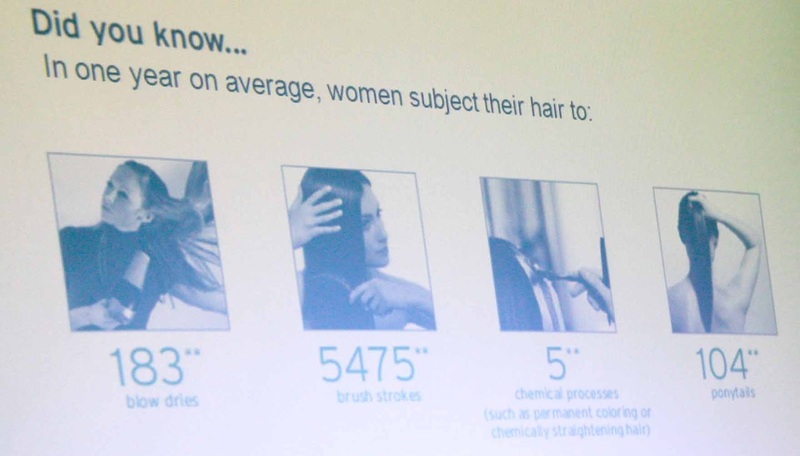 I never really understand why a line of hair care system could have at least 4-6 products and it was well explained during the event. The prices are shocking, I tell you, especially if you were just starting up on a job and saving is quite hard to do due to a lot of expenses at home. 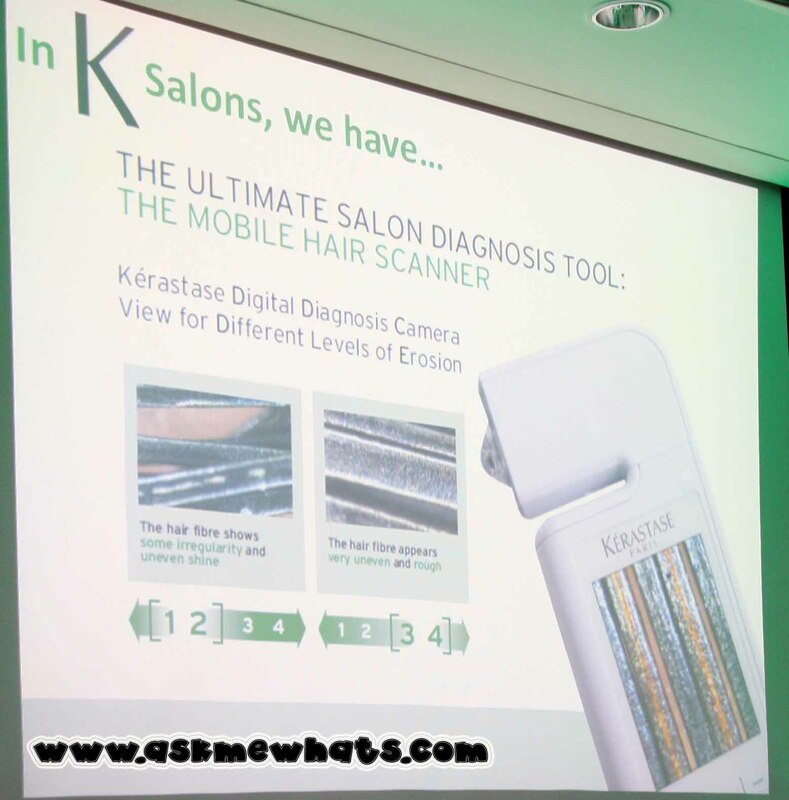 I have a tip though, have your hair checked via the Mobile Hair Scanner. 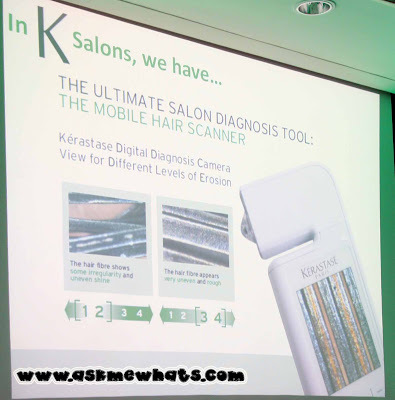 Salons that offers K-services would have this cool, unique gadget to have your hair checked to know the Level of hair erosion. I think this is the best gadget to date especially since I get really sad when I visit salon who would tell me how "damaged" they think my hair is and that it's technically "no hope" UNLESS I try this certain treatment. Lying no more! We were all led inside a room where Laura would personally help us check the situation of our hair. Seriously, at this point, I am contemplating on running away as I am scared, and embarrassed, to have everyone listen what a huge Level 4 I was! Would you believe the shock of my face when Ms. Laura told me I'm on Level 2 and probably have a few strands of hair on Level 3? I let out a huge "O" and nearly argued with her! I explained to her how I have constantly heard from various salons on how "damaged" my hair was from all the hair coloring and tools I've used! I guess the constant weekly hair treatment plus the amount of money I have spent on my hair has actually paid off! Now that I know the "real" situation of my hair, I am bound to target on what my hair needs and save up on the right type of product needed by my hair! I know a lot of you are scared to shell out a huge amount of money for a product, I suggest you save up the ONE star product you would want to try, purchase it before you go all out with the whole collection! 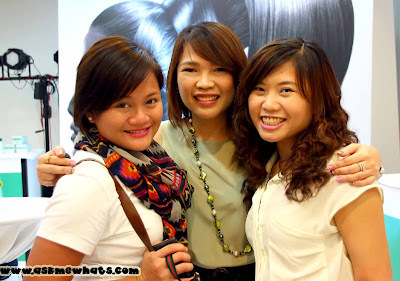 Happy girls who doesn't have"that level" of a damaged hair! Can you guess and tell me what your Hair Erosion Scale could be? 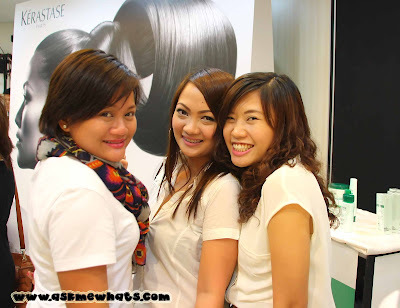 Would you promise to take care of your hair by using the right kind of hair treatment/products? 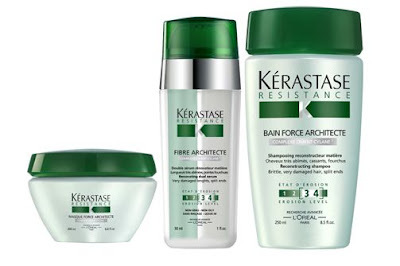 "To avail of the new Force Architecte, visit your nearest Kerastase salon. 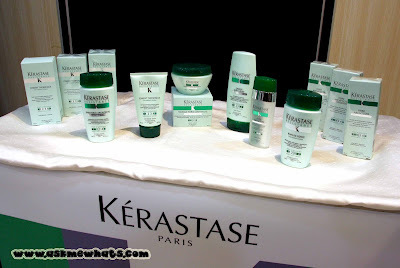 For more information, visit the official Kerastase website at www.societedekerastase.com or call the Kerastase hotline (632) 672-7200. "